One of my all-time favourite combinations: sweet watermelon and salty feta. The pairing is ultimately delicious, and I can’t get enough of it. If there is anything resembling a watermelon salad on a menu, it has to be mine! This salad is so simple, and so it depends on the quality of both the watermelon and the feta. The fresh mint helps to elevate all of the flavours, and I like a wee drizzle of balsamic for a bit of acid. 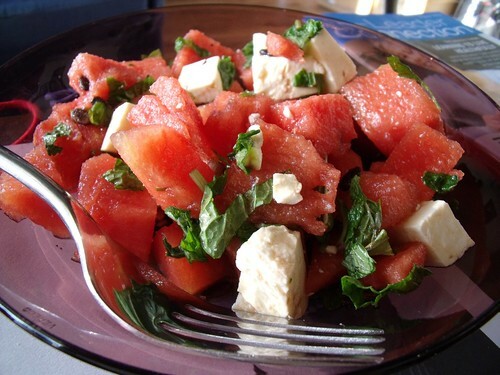 Gently combine watermelon, feta, and mint in a large bowl. Drizzle a splash of balsamic over top. Taste and add more balsamic if you’d like. Eat with delight — this is a savoury/sweet fruit salad to-die-for. It looks so pretty but I just can’t get my head around it! haha, much like many of the other funny food combinations, I think of each flavour and wonder how they’re going to work together. I’ve seen this done so many times, so it must be good. Thanks for the reminder of this..
Oh, I think it would be so pretty on skewers! You could use some of those salty, cured, black olives too! YUM! Yum! I just recently discovered this awesome combination. I haven’t tried it with mint, though–that sounds lovely! The other day I added some thinly sliced red onion, which was nice. This is one classic summer dish! I so love my classics,…They never fail us!